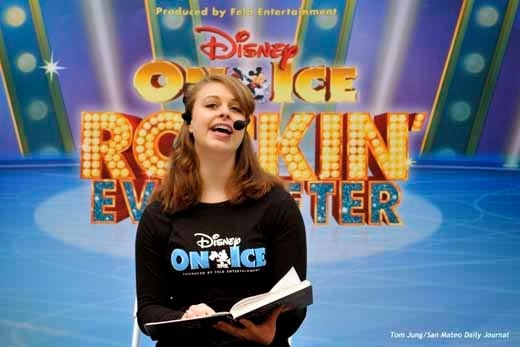 Hey, it's not every day you get to photograph "Belle" from the Disney On Ice Production of "Rockin' Ever After". I have to tell you, I've never fallen for a cartoon character as hard as I fell for her, with the possible exception of Princess Aurora from Sleeping Beauty. But I digress. 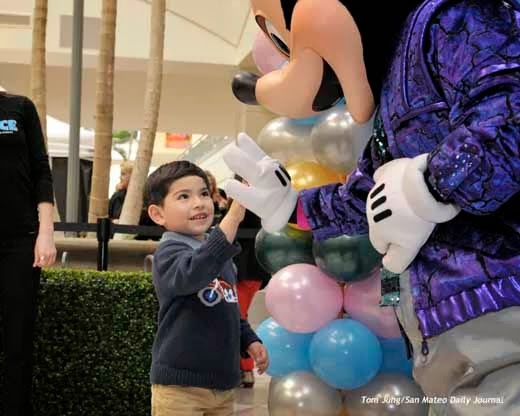 To promote this Disney Extravaganza, actors from the show came to a local shopping center to meet and greet a crowd of young admirers, and I, ever obliging, went there to make a photo or two for the Journal. As usual, parents brought their kids to be photographed with these superstars of the preschool set, and the event handlers, dressed in black, kept the lines moving "in a most delightful way". I know this is not the most creative shot I've ever made, but it occurred to me that I could have used this shot because nobody is recognizable. As shot, the image in the iPhone is too small, but had I a longer lens, it might have worked. I going to file this shot away as a possible solution when I can't get any names. Perhaps it would have worked if I had moved more to the left and had a longer lens. Oh well. Most of the shots would not be submitted to the Journal, so I shot mostly for fun. I think of this as "Catch and Release" shooting, photography done "just for the fun of it." And since I don't use names in the blog, specific subjects have a reasonably safe level of web anonymity. 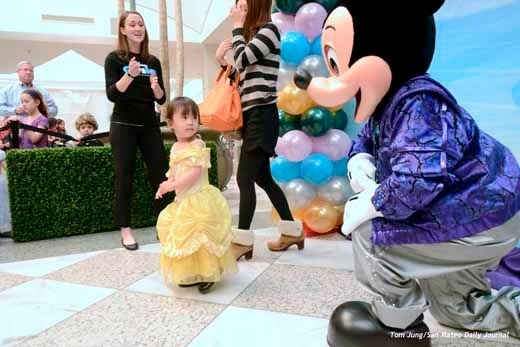 It's fun to watch how children react to cartoon characters who have come to life. 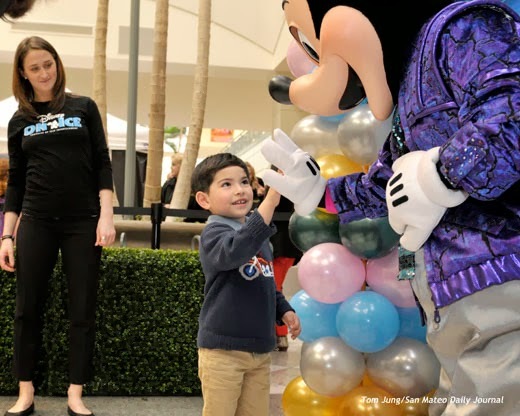 And while the fear of clowns is well documented, one has to stop and think about what goes through a child's mind when he or she encounters a gigantic, unblinking humanoid such as our friend Mickey. Without the benefit of facial expressions, there are no visual cues as to how such an encounter should be framed. 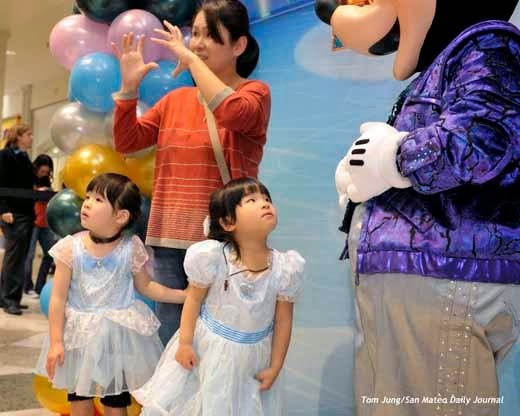 These young sisters don't seem to know just what to make of Mickey. I suspect that they knew somebody was inside the Mickey Head, and if they looked hard enough, they might just get a glimpse of who it was. This young man gets a "high five" from the Big Guy himself. No shortage of self confidence here. "Belle", was easier for most children to respond to. 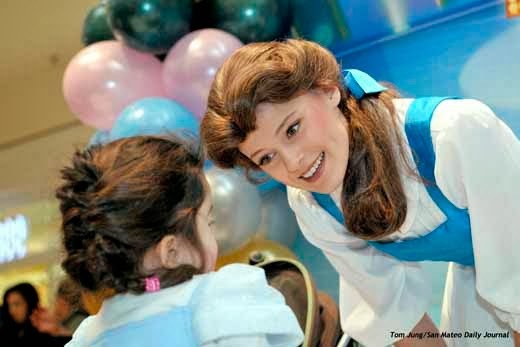 This young lady brought her coloring book, and asked Belle to sign it. I spent a little more than an hour photographing the event and ended up with a few shots suitable for publication. Working fast in close quarters is a skill worth developing. It's also entertaining, especially when you're surrounded by little fanboys, and little fangirls. For Those Technically Inclined: 1/250 of a second, F 4.0, ISO 1600, flash white balance. Lighting was primarily from an overhead skylight, with a slight contribution from some incandescent accent lights. An on-camera SB-800 with its diffusion dome was mounted on each of my two working cameras. The power was set to 1/32, just enough to produce a catch light. TTL metering is problematic when the ISO goes above 800, so the tiny bit of light doesn't actually fill the shadows. It just gives a tiny bit of twinkle to the eyes. Selecting the photo for submission became a game of inches. Photo #1: Who is that Pretty Girl with the child? Photo #2: The photo says "Disney", but nothing "says" Disney. Photo #3: Maybe next time. Not enough detail in the cell phone. Photo #4: Couldn't find the child after the photo was taken. 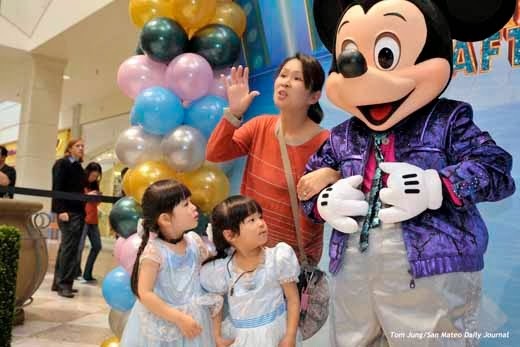 Photo #6: Nice Mickey, but Little Girl #2 seems to be looking at his hands. Photo #7: Good eye contact, but not enough Mickey showing. 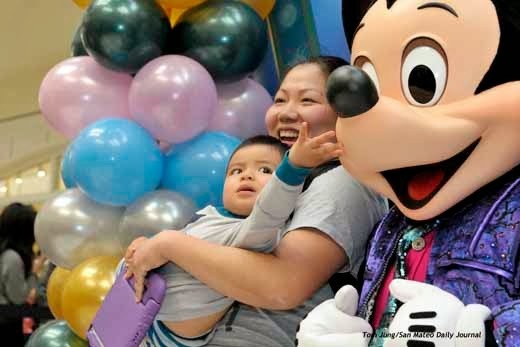 Photo #8: Good Mickey, good child expression. Fairly close to following the Rule of Thirds. This is the photo I submitted. Photo #9: Pretty Girl with child. 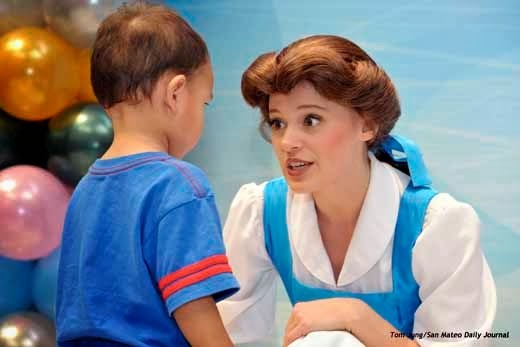 Belle isn't as easily recognizable as Mickey. 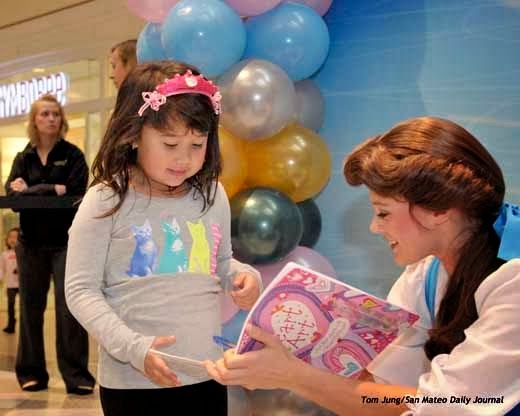 Photo #10: Pretty Girl with Pretty Girl signing book. Again, Belle not as recognizable as Mickey.Also, Belle is too close to the right edge, the result of poor framing when the shot was made. As a post script, Photo #8 was returned with a request: Is there a shot that shows more Mickey? Since my submission was cropped, I re-submitted the image as it came from the camera. 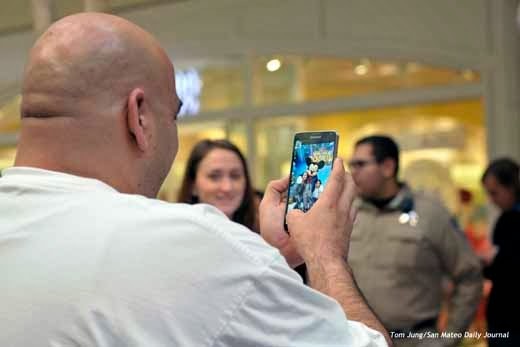 Photo #11 shows the smiling Disney handler looking directly at my young subject. While it decreased the size of my subject, his smile carried the day. The new iteration caught the eye of the Editor In Chief, who bumped it up to Page 2.